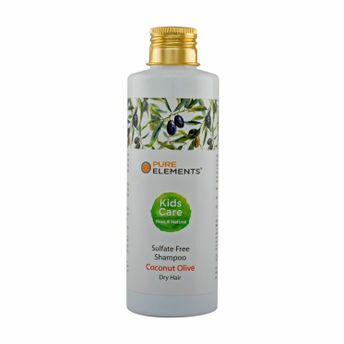 Pure Elements - Coconut Olive Kids Care Shampoo is extremely gentle scalp and hair cleanser for delicate hair of a child, formulated with naturally derived foaming agents. These are plant based and absolutely biodegradable. This extremely mild shampoo is infused with Pure Botanical Extracts, Proteins and Vitamins. Natural ingredients of this shampoo gently cleanse, hydrate and moisturize the hair to make it healthier and softer. Key Ingredients: Coconut Oil Derivatives, Olive Oil, Wheat Protein, Vit B 5, Botanical Extracts of Reetha, Amla, Nagarmotha & Brahmi. Additional Information: Created out of sheer passion for the ancient sciences of Ayurved by a young doctor couple, Dr. Anand Mandhane , M.D. (Ayu Med) & Dr. Suteja, an ayurvedic consultant., 'Pure Elements' brand brings to you purest elements of nature all handcrafted into wellness products that are therapeutic in nature and are formulated to address specific skin and hair concerns.These products are made with ayurvedic decoctions, organic ingredients, botanical extracts, essential oils, fruit extracts, floral waters, natural oils & butters. Each product is free from parabens, mineral oil, alcohol and other harsh chemicals, all crafted with absolute purity and passion.